Richard J. Bolles was born in New York City on August 1, 1843. The son of a doctor, Bolles' instinct for business was apparent early on -- by 1886, at the age of 23, he had already acquired a seat on the New York Stock Exchange. Bolles had multiple business interests in various states across the nation, including a mine in Colorado and farm lands in Oregon. 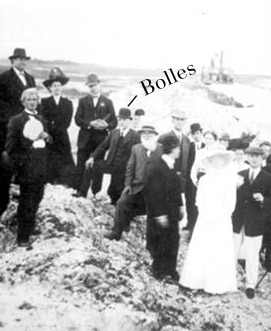 In 1906, Bolles' business dealings came to the attention of Florida's former and current governors, Jennings and Broward, who hoped his success in land development and his millions in cash could ease them out of Florida's reclamation crisis. On December 26, 1908, the trustees of the Internal Improvement Fund signed a contract with Richard Bolles, conveying to the latter 500,000 acres of overflowed state lands for two dollars an acre. As part of the deal, the State agreed to use half the proceeds of the sale for drainage and reclamation purposes. Dicky Bolles became the second million-dollar purchaser of lands from the State of Florida (matching Hamilton Disston's investment in the 1880's). Bolles founded the first of his Florida enterprises, the Florida Fruit Lands Company, to dispose of 180,000 acres in Dade and Palm Beach Counties. The company divided the lands into 12,000 farms of varying size and designated a townsite, 'Progreso', with plans for streets, factories, schools, churches, and public buildings. For the price of $240, a buyer could purchase a contract from Florida Fruit Lands Company, entitling them to bid on a farm and town lot through a scheduled auction. This same scheme was employed by other sales ventures pitching swamp land in Florida, including Okeechobee Fruit Lands Company, which dealt in Bolles' remaining 428,000 acres around the shores of Lake Okeechobee. Eager salesman from the Florida Fruit Lands Company and similar ventures crossed the country, promoting the Everglades as a "Garden of Eden", a "Tropical Paradise," or "Promised Land". These "swamp boomers" enticed potential buyers with sales literature quoting government officials who extolled the possibilities of the Everglades. In one such advertisement, US Secretary of Agriculture James Wilson said "that doubting Thomases who were waiting for the Everglades to develop before buying would regret it all their lives" (Hanna and Hanna, 1948). Bolles' land promotions reached a feverish pitch in March, 1911, when his Florida Fruit Lands Company held a giant land auction in Fort Lauderdale. 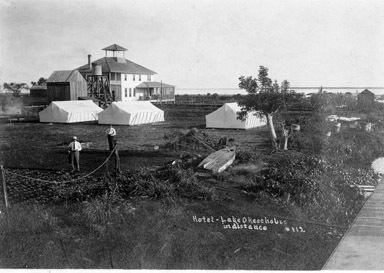 When representatives of the potential bidders realized that no auction was to take place; that they were expected to execute deeds already designated by the Company; and that the purchased lands were still under water, they brought suit against Dicky Bolles and the Florida Fruit Lands Company. The case was settled in November 1913, with the court allowing Bolles to keep the $1,400,000 already paid him, but prohibiting him from collecting any further funds until the State had fulfilled its contract to drain and survey the Everglades lands. Federal prosecutors also initiated a case against Bolles and his cohorts, producing a 122-page indictment and more than 100 witnesses from across the country. Bolles was arrested on December 18, 1913 and tried the following March -- he was found to be "an honest man". Successive efforts to indict the land speculator were foiled by Bolles' ingenuity. He continued to maintain that he believed what federal and state officials said about the Everglades, and that his opinions rested on the many substantial investigations already conducted to assess the possibilities of Everglades drainage and reclamation. On March 25, 1917, Richard "Dicky" Bolles died shortly after boarding a train at Palm Beach. With him died the dreams of many disillusioned Everglades land buyers.The proposed town of Progreso never materialized; the majority of land contracts lapsed; and much of the property purchased from Bolles' enterprises reverted to the state for nonpayment. View from Bolles Hotel at Ritta, Lake Okeechobee. Biography prepared by Gail Clement, Florida International University, adapted from Hanna and Hanna, Lake Okeechobee, Wellspring of the Everglades, 1948.